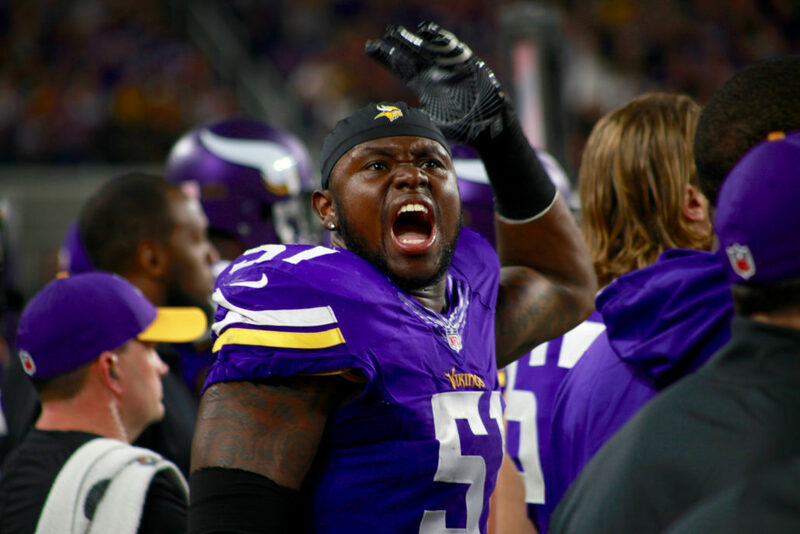 The Vikings added depth to the linebacker position through the draft and free agency. Will the additions increase the overall competition in training camp? Find out why Daniel House believes linebacker will emerge as one of the underrated preseason battles. Updated: July 17, 2017, 1:10 p.m. Depth has been issue at linebacker over the past few seasons. This year, it's a different story. The linebacker position will quietly pose a competition in Vikings training camp. Outside of Anthony Barr and Eric Kendricks, the depth chart is wide-open for young players to make a contribution. Chad Greenway retired this offseason and Audie Cole joined the Jaguars in free agency. These departures leave at least two openings for a young player to earn a roster spot. In addition, Greenway's departure opens a starting role at weakside linebacker. If the Vikings keep Eric Kendricks at middle linebacker in the base defense, third-year linebacker Edmond Robinson is the favorite to land the starting weakside spot. At 6-foot-3, 245 pounds, Robinson has shown his length and athleticism can be a fit in this defense. He can be sent off special packages to get after the quarterback or create pass breakups in coverage because of his blend of speed and size. In 2016, Robinson was putting together a strong training camp before suffering in injury that caused him to miss a portion of training camp and the preseason. If the coaches pick Robinson as the starter, they can develop special sub-packages to fully utilize the athletic trio of linebackers on the field. Another competitor for Robinson, veteran linebacker Emmanuel Lamur, missed two weeks of spring practice with an undisclosed injury. Lamur has played just 38 snaps since reuniting with his former defensive coordinator, Mike Zimmer, in Minnesota. He has shown below average instincts and struggles to tackle consistently. With a nonguaranteed $2.45 million in his contract, Lamur will need to show he can fit in this defense to keep a spot on the roster. The Vikings drafted Michigan product Ben Gedeon in the fourth round to potentially ease his way into a base 4-3 starting position. However, he's more of a natural fit at MIKE linebacker in this system. With that being said, the Vikings may be forced to move Eric Kendricks and Anthony Barr outside, sliding Gedeon into middle linebacker. Gedeon is a pure two-down run defender with fantastic instincts and tackling ability. He wasn't tested in coverage, but the small sample size of tape shows he is serviceable in this category. If he plays middle linebacker and Eric Kendricks moves to the outside, his skill-set will be perfectly utilized. The goal this offseason was to upgrade a base defense that was exploited in the passing game. Over the final three games in 2016, opposing teams had success when using a tight end against the Vikings' base defense. Minnesota allowed 58.6 yards per game to opposing tight ends over the final three games. All of the Vikings' linebackers struggled to handle 1-on-1 isolations and crossers. It appeared Eric Kendricks and Anthony Barr were breaking down physically and Chad Greenway was aging. The key for this group will be to stay healthy and find a third option that allows each player to execute their designed role in the base package. Training camp and the preseason will ultimately shape the starting lineup. The winner of the job will be used in a part-time role as the Vikings are in nickel packages for over 60% of their total defensive snaps. Aside from the starting competition, the linebacker position is also intriguing within the depth spots. The Vikings drafted Kansas State linebacker Elijah Lee and signed Cincinnati undrafted rookie Eric Wilson to compete with second-year linebacker Kentrell Brothers. Lee brings range, athleticism, and above average coverage skills to the defense. He needs to add more weight to his frame to improve against the run, but he is a developmental option. In addition, Eric Wilson is a name nobody is talking about heading into training camp. He notched 129 tackles during his senior season and shined as an impressive tackler in space. He is undersized, but makes up for it with his above average instincts. Not to mention, Wilson was a quality special team performer throughout this college career. He could carve out a role on this team because of his versatility. Finally, Kentrell Brothers is the incumbent in the room and flashed his tackling ability within a special teams role. He is a very compact player with the strength to fight through blocks. More importantly, Brothers has carved out a role because of his strong play on special teams. Last year, he was named one of the league's best special teams contributors, according to Pro Football Focus. Brothers was recognized for his performance on the punt coverage and kickoff return units. If the Vikings keep seven linebackers, all of these players could crack the final 53-man roster. However, training camp performance will likely determine whether the Vikings keep six or seven linebackers. With the potential surrounding each of the young depth options, linebacker is quietly a strong position battle heading into training camp.